What Is The Resale Royalty Scheme? Kangaroo Island is abuzz for the next four days, as the annual KI Cup Racing Carnival swings into action. Get set for a full schedule of horse racing, fashions of the field competitions, and a host of community sporting and social events. Race day fashion can be effortless if you know where to find the perfect accessories. But let’s face it, if you’re going to make a real impression on the Fashion of the Field judges at the Cygnet River course this year, you’re going to need something unique. Something that elevates your look from interesting to unforgettable. 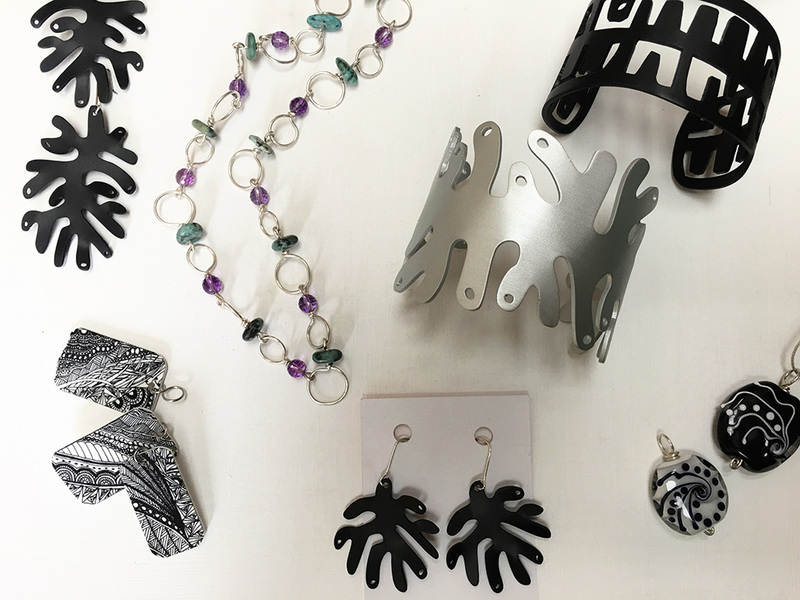 If you’re still searching for that unforgettable look, come choose from our collection of Kangaroo Island fine art jewellery and accessories. You’ll find a little of everything in our Kingscote Gallery, from silk scarves and beaded bags, to every kind of hand-made jewellery you can imagine. For traditional Race day fashion in black and white, we’ve put together examples of some striking jewellery options in stock at the moment. For a quick win or two in black and white, check out the classic looks above. The perfect summer accessory in black and white, these gorgeous earrings can be teamed with other pieces from the Squink range for an edgy, relaxed finish to your Kangaroo Island Cup outfit. Some pieces also available in alternate colours. Truly unique, easy to wear, and more than a little reminiscent of the ancient art of scrimshaw, these stunning black and white pendants are the perfect finish for a classic race day fashion statement. At this price you can grab more than one. Prefer something a little smaller to add that extra polish to your Cup Carnival fashion? This smaller version of the eye-catching Seaweed earrings by Cecilia Gunnarsson are just the thing. A spectacular addition to your black and white fashion game, these gorgeous hand worked glass pendants are created by heating and forming glass shapes, adding new colours, heating and working the glass some more. Unique and beautiful. Perfect for catching the judges’ eyes. Here’s the perfect match for those Seaweed earrings. Need a little extra contrast, or want to bring out that splash of colour in your outfit? Take a look at the other colours available. Whatever you need to nail your Kangaroo Island Cup fashion play, we’re sure you’ll find it at Fine Art Kangaroo Island. Going for a little soft colour to complete your look? Why not grab this amazing piece from Peggy Rismiller? Made to be worn either long or short, the colours in this necklace reflect the setting track side at the Cygnet River race course. It’s summer on Kangaroo Island, and maybe you’re thinking of bringing a touch of sand and sea to your Kangaroo Island Cup Carnival outfit. 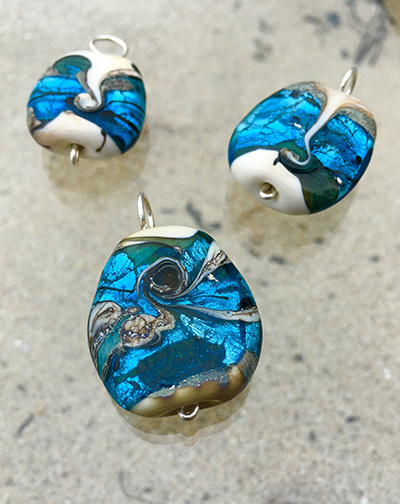 Take a look at these stunning lampworked glass pendants from Simply Bea. Vibrant colours and patterns reflect the movement of waves breaking on the beach. All of it can be seen in these truly remarkable pieces. The spontaneity of the lampworking process seems almost to have been captured within the glass as Bea worked to create them. Even the foaming of the waves and the presence of tiny sea creatures are depicted in the colours and patterns of each piece. Sterling silver completes the look, making each pendant perfect as a Race day fashion centrepiece. Whatever your look, you’ll find the perfect piece among the gorgeous array of jewellery and accessories at Fine Art Kangaroo Island. Come in and see us now to choose your new favourite peice.